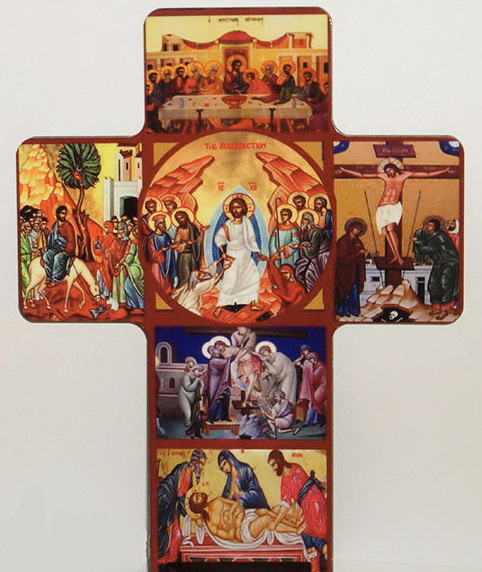 One of the Dominical and fixed feasts of the Armenian Church is the Presentation of the Lord, or, in Armenian, Dyarnentarach. It occurs invariably forty days after Theophany, or on February 14. This feast represents an important event in Jesus’ infancy. It is regarded as Scriptural confirmation of His Revelation as God. According to Jewish canons, a woman who had borne a child was obligated to go to the temple on the 40th day to present God with a gift and pray. For such occasions, those who were wealthy would bring a select sheep, a pair of doves, and money. Those who were poor might take only the pair of doves, and a modest sum of money. Joseph and Mary fell into the latter class. In carrying out this accepted canonical practice of visiting the temple and offering a sacrifice, new mothers would be fulfilled in being purified with “fire and water” after bearing the child, while the newborn would become blessed. It was in conformance with this practice that 40 days after the Holy Birth, Mary took the infant Jesus to the temple. During those days a familiar figure in Jewish religious circles, a man named Simeon, dwelled in Jerusalem. He was a just man of advanced age. He had always prayed to God to have his life extended that he might with his own eyes see the Savior of the world and of mankind. God had heard his wish and prayers. While Mary was in the temple with her family, by providential circumstances the aged Simeon also had come into the temple. Seeing Mary and the infant, he miraculously sensed God’s presence. And he called out in a loud voice, “Lord, now lettest thou thy servant depart in peace, according to thy word: for mine eyes have seen thy salvation, which thou hast prepared before the face of all people; a light to lighten the Gentiles, and the glory of thy people Israel…” (Luke 2:29-32). This is a scriptural episode, one of many, in which the revelation of God is emphasized. This feast of Presentation is made more appealing through the idea of going forward (-entarach) to meet the Lord (Dyarn-), hence the name Dyarn-entarach, or sometimes contracted to Derndes (from “Der” – Lord, and “des” – see). 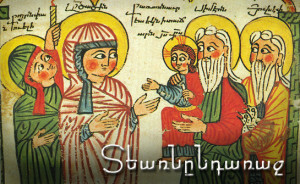 Over the centuries the scriptural episode of the presentation of the Lord has been the source of inspiration for many artists of Armenia and of other lands. Their creative works of fine art enriched their cultures in literature, miniature illumination, and religious art. The famous medieval Armenian painter and miniature illuminator Taros Rosiin has a noteworthy work (1267-68) on the Presentation of the Lord. 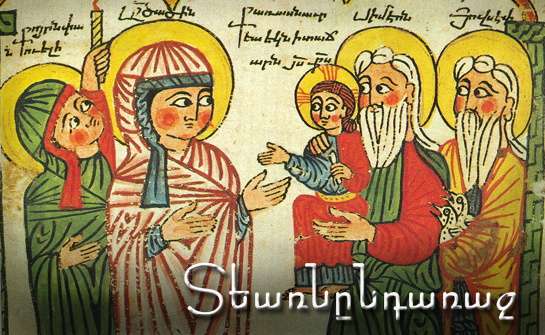 In the Armenian Church the feast of the Presentation of the Lord has not been one of a purely religious character. The fact is, that blended in with its Christian meaning are many old customs, traditions, and beliefs that have for centuries enjoyed great popularity. However, today, as a consequence of the new pattern of Armenian life, the old traditions associated with the Presentation of the Lord are only relatively of interest, while the purely religious, Christian aspect remains, as before, a deeply significant ceremony within the church. At this point we would call attention to the fact that national traditions were being retained generally more in the fatherland, and in the lands of his­ toric Armenia, at least until the Great Massacres and Deportations of 1915. Undoubtedly, the environment of our native land and air had much to do with the retention of our old traditions. On the evening of February 13, the eve of the feast day of the Presentation of the Lord, a place would be set aside in the courtyard of the church with plenty of wood and branches, ready for a bonfire. Immediately after the evening service in the church, the faithful, and especially newly married couples, would gather around the point of festivities. The bonfire was started with candles brought out from the church service . The fire would increase in intensity alongside the merriment, as men, young and old alike, would leap over the fire. The air was filled with hoorahs and shouts of encouragement to the jumpers. Armenian peasant farmers used to take ashes and spread it in their stables and over their fields, believing it would enhance the fertility and provide a better harvest in the following year. Heads of families used to spread a handful of ashes on the roof of the house to keep evil spirits away from their home and hearth. It was believed that the ice would melt away and the winter freeze would give way to the power and force of fire, bringing forth goodness and plenty. The countryside would undergo change and warmth would return. Another custom remained from pre-Christian pagan beliefs that newly married brides needed to leap over the fire for purification, and to consecrate their fertility. Also, infertile women scorched their skirts with the same flames to banish their infertility and enable child-bearing. All present at the bonfire had to take a light from it, with a candle or a kerosene lamp, and take it home, keeping it going all the night through so that Light and Wisdom would prevail and misfortune would be banished. The bonfire festivity, and the associated customs and beliefs remaining from pagan times were sometimes very seriously criticized and condemned by the church fathers. Nevertheless, those practices continued to be observed, and generally tolerated when it was seen that people loved them and that they were essentially good in their intent, and the occasion for healthy recreation. It is an unassailable fact that such customs have come down from pre-Christian times and that they reflect the most ancient beliefs of the Armenians. It is certain, as it is with other peoples, that the Armenian people too have worshipped the fire as they have various other elements of nature. In fire worship they had the sun god Mihr, and Aramazt in whose name there were temples containing eternal flames.